1 Square Table 59Wx59Lx29H. 8 Stacking Armchairs 23Wx23Dx36H. Seat Dimensions:16.5Wx17Dx18H. Dine in comfort and style with the Hampton Bay Kings Square 7-Piece Dining Set. 4 stationary chairs and 2 swivel chairs feature durable steel construction, olefin cushions in a beautiful red fabric, and plush lumbar pillows for added comfort. The rectangular dining table has a lattice tabletop pattern that coordinates with the chair backs to create a decorative and uniform set. The Maple Valley set adds elegant style and comfort to your outdoor living area. The 7-Piece Dining Set features one 63 x 38 rectangular dining table with Nashiji glass top, four stationary dining chairs and two swivel chairs. Both the table and the chairs are framed steel accented with a elegant design. The cost-efficient 7-piece Dining Set is sure to accommodate friends and family comfortably making entertaining outdoors a pleasure. This set is packed in 2 boxes and assembly is required. 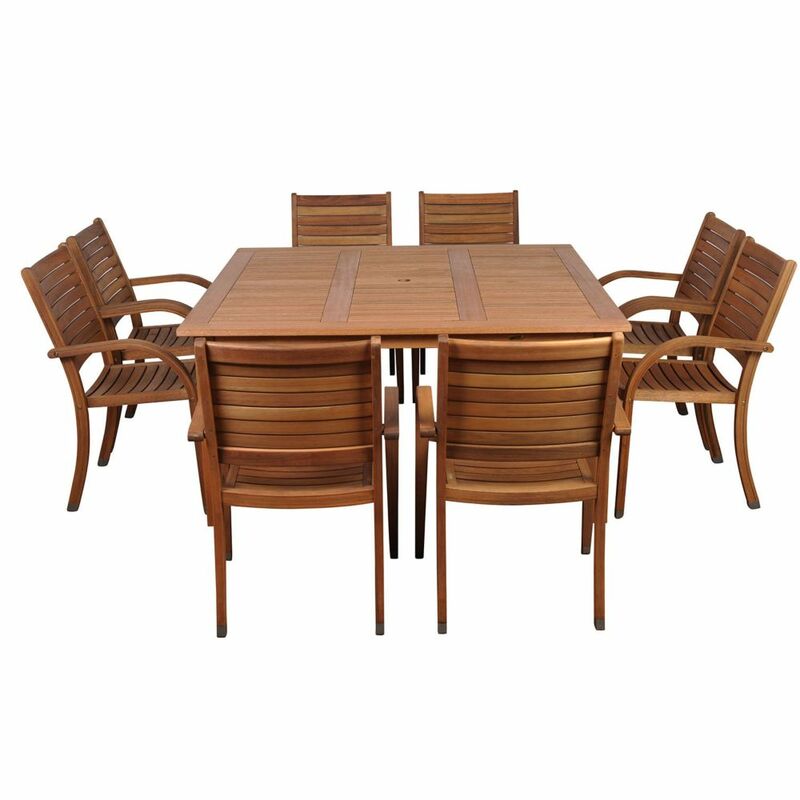 Arizona Square 9-Piece Eucalyptus Patio Dining Set The Amazonia Collection is committed to providing premium quality sets with an elegant design that will make your home stand out above the rest. Crafted from solid Eucalyptus Grandis wood, grown in 100% managed forests in Brazil and certified by the FSC (Forest Stewardship Council), this eucalyptus furniture is known for its longevity and craftsmanship at an affordable price. Enjoy your patio in style with these great sets from our Amazonia Collection. Arizona Square 9-Piece Eucalyptus Patio Dining Set is rated 5.0 out of 5 by 5. Rated 5 out of 5 by MJ from Gorgeous, large table. Square design provides flexibility in seating. Wood is beautiful, setup wa... Gorgeous, large table. Square design provides flexibility in seating. Wood is beautiful, setup was easy. Rated 5 out of 5 by Rebecca from Super easy to set up. Chairs are comfortable. Patio set... Super easy to set up. Chairs are comfortable. Patio set is very nice. Rated 5 out of 5 by Showboat from This is an absolutely BEAUTIFUL set..nice quality...well worth the money. I've only had it for le... This is an absolutely BEAUTIFUL set..nice quality...well worth the money. I've only had it for less than one season. You only need to attach the legs to the table, two screws per leg. The screws should be heavier in my opinion. The chairs come stacked 4 to a box and are assembled. The table box is quite heavy. I advise laying the table on its top to attach the legs and use at least two people to flip it over so as not to put too much side stress on the legs. The chairs only push a few inches under the table top. The reason is primarily the edging under the table lip. However, the table would not be large enough anyway to have all chairs pushed under up to their backs even if the edging wasn't there. I'd also recommend not purchasing the Duck 92" cover expecting to cover the entire set. The chair backs are higher than the table so the dip that forms in the center of the table collects rain and snow. Instead I'd recommend a cover just for the table then stack the chairs in groups of 4 and cover each separately. Rated 5 out of 5 by Anonymous from Amazonia Arizona Patio table We love this table. Chairs were already assembled and table was a breeze. A great appearance on our patio.